Do you know how many federal agencies there are? Do you have any idea how many “rapid response teams”, special weapons and tactics units, and heavily armed and armored “police” forces there are in this nation? Does that scare you a little? It scares me. How many of you are aware of the fact that the DHS recently purchased 1.2 billion hollow point rounds? I have friends and colleagues who have pointed out that their officers need to train with their weapons, and therefore it makes sense that they purchase ammo in bulk. Really? I am a gun owner. I practice with my weapons. I do not know a single soul that goes target shooting with hollow points. They are designed to essentially shatter on impact, doing as much damage as possible to a human target. Paper on the other hand…they kinda punch right through and keep on going. Besides…they’re more expensive than “range rounds”. The Dept of Education put out a request for bids to supply them with 20 tactical shotguns. I know classrooms are getting a little crazy these days, but are we skipping detention altogether and going straight to execution now? Or are these weapons to be used on parents that do not help with homework assignments? The EPA recently conducted a “commando style” raid on a camp of gold miners in Alaska. Their purported purpose was to check for violations of the Clean Water Act. When last I heard, water samples are taken with vials, not shotguns. We are creeping ever closer to a totalitarian police state, very much like Soviet Russia. Much like the Truman show, we are content to live our lives as they are because we are unaware that our freedom is an illusion. 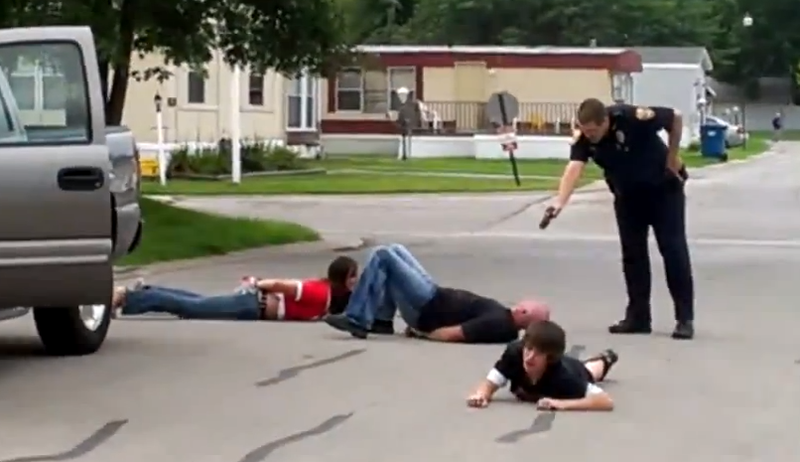 Witness the family in Ohio, yanked from their car, handcuffed and made to lay face down in the middle of the street, threatened and assaulted by an out of control cop. Why? Because they dared to question his actions in ticketing a neighbor. Read more about this Nutjob Cop Here. As we continue to cede more and more of our liberties to our government in the name of “security”, we endanger the way of life we purport to be protecting. The people speak out, they vote, they march, they boycott, they picket, they rally… The government is not listening. But rest assured, when you call someone, when you email someone, when you surf the web…the government is listening. On October 1st, if nothing is done to stop it, Obamacare will go in to effect. Ostensibly, the goal is to provide all Americans with access to affordable healthcare. Anyone who believes that this will be the reality is fooling themselves. Once the government has control of your medical records; once the government has panels in place to determine your eligibility for various procedures; the nature of the relationship of the citizen to the government will be forever changed. The pieces and parts are already in place. The beast coalescing before our eyes. Like frogs in a pot of water, we sit unaware that the heat is rising. The differences between the United States in 2013 and the DDR in 1977 are few, and pertain mainly to the language spoken. I fear that my children will grow up in an America very different from the one I knew. Not because of progress or innovation, but because they are not now, and never will be again, free. Someone let ol’ Abe know. Government of the people, by the people, for the people…has perished from the Earth. This entry was posted in Big Government, End of America, Liberty and tagged Big Government, End of America, Government Agencies, Liberty. Bookmark the permalink.